The stage was set. A car parked under the awning at the foot of the stairs. A man stood next to it as if guarding the space. This seemed required as many people were beginning to gather. Thrangu Rinpoche, spiritual teacher and head of this monastery was on his way back to India, his home since his withdrawal from Tibet. We were not sure he would ever return to Vancouver. His age and failing health were taking its toll. The crowd amassing to wish him safe travels was growing. We all wanted to get one last blessing before he left us. I wanted one last smile. A line formed to pass in front of Rinpoche before he headed down the stairs. I made my way forward. He put out his hand and smiled, my heart grew. I lightly drew his hand in to touch my face. A gesture not planned but needed. I smiled back, content knowing this might be our last meeting. At least for this lifetime. After the blessing I moved to the waiting car wanting to catch a final glance as Rinpoche drove away. I stood by the man still guarding the car door. The blessings complete, and time to go; two monks helped Rinpoche as he started down the stairs. All eyes were on him so none of us saw the man standing next to me drop to the ground and lay flat, covering the pavement between the bottom step and the car. As we turned at the commotion there was a collective gasp. Two Lamas came to his aid and encouraged the man to get up. Huddling over him. The man did not move. It was his obvious intent from the beginning to do this. An extreme supplication. Rinpoche came down the stairs and with the monks supporting him; he stepped on the disciple’s back and maneuvered into the car seat. The crowd stayed silent. 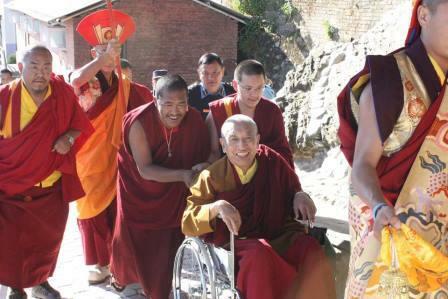 The door was shut and a monk patted the man’s back and whispered, “Get up, get up, say good bye to Rinpoche”. He jumped to his feet as Rinpoche’s window came down. I was close enough to see their eyes meet. Both men nodded. I felt the love pass between them. The man stepped back and Rinpoche waved to the crowd. We all bowed. The car drove away. The mystery man stood next to me. He looked content. I reached out, touched his shoulder and said, “That was lovely”. He turned and walked away. I was humbled to be a witness to such homage. Moments like that are priceless, aren’t they? They are… and I always feel so blessed to experience them!